On August 6, 1966, 38-year-old Miami Township Constable Roy E. Carter was directing traffic at the scene of an accident on Branch Hill Loveland Road in Miami Township. A male ignored the directions of Constable Carter and fled the scene at a high rate of speed. Constable Carter pursued and stopped the male and while attempting to place him under arrest, the male resisted. Constable Carter was eventually able to subdue the male and place him in handcuffs. Clermont County Deputy Sheriff Robert Jones arrived at the scene and Constable Carter told him that the male had hit him in the chest several times during their struggle making it difficult for him to breathe. Constable Carter and the male, who received injuries from resisting, were transported together to Our Lady Of Mercy Hospital in Mariemont. Constable Carter passed away approximately twenty minutes after arriving at the hospital of an apparent heart attack. His wife Irene and two daughters, Bonnie 16, and Pamela 13 survived Constable Carter. Constable Roy Carter understood the meaning and importance of public service and paid the ultimate sacrifice while performing his duties as a Miami Township Constable. After forcibly subduing a man who, he said, he would charge with speeding, Roy Carter, 38, a Miami Township constable, was hospitalized and died 20 minutes later. It is believed that a heart attack was the direct cause of death. Constable Carter, who also was an officer of the East Milford Fire Department, was directing traffic Saturday night at the scene of an accident on the Loveland Branch Hill Road. A car driven by Stanley Lewis 37, Lewis Road, Loveland, is purported to have ignored directions and fled the scene at a high rate of speed. Constable Carter followed, and caught the man who is said to have resisted until the officer finally subdued him. Carter told Deputy Sheriff Robert Jones, who later arrived at the scene that the prisoner had struck him several times in the chest and that he, Carter, "could hardly breathe. "He was rushed to Our Lady of Mercy Hospital together with the prisoner. Constable Carter is survived by his widow and two daughters Bonnie, 16, and Pamela, 13. The family home is at 1187 Catherine Drive, Milford. Funeral Services were held Wednesday. MILFORD, Ohio -- Roy Carter, 38, a Miami Township constable, died late Saturday night after subduing a driver who resisted arrest, Sheriff Donald Watson said Sunday. The constable was directing traffic at the scene of an accident on the Loveland Branch Hill Road when a driver ignored his directions and drove through at a high rate of speed. Mr. Carter pursued the driver and radioed Sheriff Watson for help. After a chase of about two miles, the driver stopped his car so suddenly it slid off the road and was damaged. When the constable came up the driver began to fight, the sheriff's office said. He hit me in the chest several times," Constable Carter told Deputy Sheriff Robert Jones when the latter arrived. I can hardly breathe, he added. The constable had subdued the driver, however, and had him in handcuffs. Both the constable and the driver were taken to Our Lady of Mercy Hospital where the officer died 20 minutes after arrival. Death was attributed to a heart attack. The driver of the car was Stanley Lewis, 37, Lewis Road, RR 4, Loveland. No charges have been filed against him. So far as is know, Constable Carter did not complete making out a citation against him. The constable and his wife, who live at 1187 Catherine Dr., Milford, have two daughters, Bonnie, 16, and Pamela, 13. He served part time as constable. He also was an officer of the East Miami Fire Department. He was employed at the General Electric Co. Services will be at 10 a.m. Wednesday at the Monroe-Copher Funeral Home. Visitation 4-9 p.m. Tuesday. 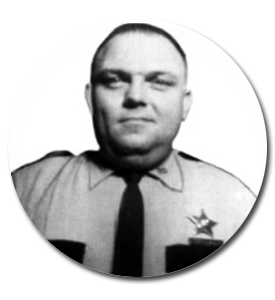 Miami Township, Ohio - A fund is being established in memory of Roy Carter, Miami Township constable who died while on duty August 6, 1966. The officer suffered a fatal heart attack after subduing a suspect who resisted arrest. Mrs. Bernard Schoenhoeft, 850 Garfield Ave., wife of another Miami Township constable, is accepting donations to the fund which willbe presented to Mrs. Carter with the names of the contributors. The fund started when numerous area persons expressed a desire to assist Mrs. Carter and her two daughters, Pamela, 13, and Bonnie, 16. Mr. Potts made a motion that Mr. Carter be appointed as an assistant to Constable Raidt, and that the township pay for his bond, the motion was seconded by Mr. England and carried. "Constable Schoenhoeft reported on the death and funeral arrangements for Constable Roy Carter, who died while performing his duties as Miami Township Constable." Carter Roy E., beloved husband of Irene Carter (nee Black). Devoted father of bonnie and Pamela Carter, dear son of James M. and Flossie Carter, brother of Mrs. Geneva McKeehan, Mrs. Wilma Dovie, Elmer and Daniel Carter, Saturday, August 6, 1966; residence, 1187 Catherine Dr. Milford, Ohio, in his 39th year. Services at Monroe-Cooher funeral Home, Milford, Wednesday, August 10, at 10 A.M. Visitation, Tuesday, 4 to 9 P.M.